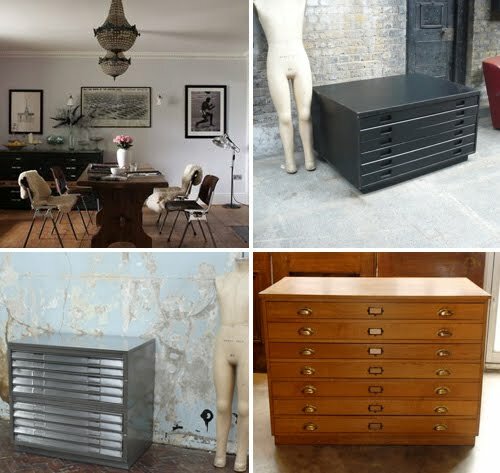 I have grand plans to buy an architectural plan chest to store my stationery in. I've been withholding this post for a while, as I actually have my heart set on one of the plan chests below and just in case one of you readers rushes off and buys it before I have the chance. Anyway, I have realised that although my heart might be set on it, my bank balance isn't quite following suit and is unlikely to for quite some time, so I'm coming out, revealing all my plan chest sources. Can you guess which one is my particular favourite? From top, L to R, Design Sponge, Castle Gibson, Elemental, Fears and Kahn. Living Etc, Castle Gibson, Castle Gibson, Retrouvious. Is it the one from Elemental?!! What a great idea for housing stationery! 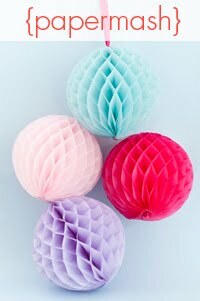 They are all lovely, but I am especially drawn to the clean lines of the first one . Ooh, what a cute selection!! You've got vintage, you've got modern...how do you choose?! 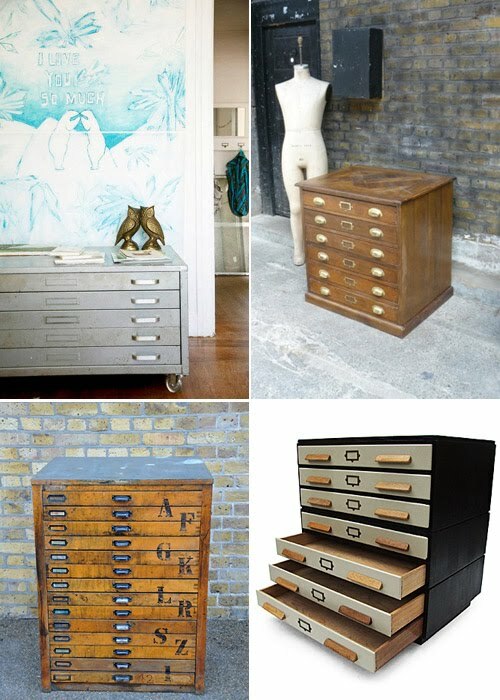 These plan chests are gorgeous, though I wouldn't know what to store in them (I don't have enough stationary). There's just something so extraordinary about them in a living space. You totally should get one someday. Hmmm, is it the wood one that might be the Retrovious? That's the one I'd pick anyway. Keep an eye on ebay if the budget doesn't stretch. You never know what you'll find. I've just salvaged a dresser/side board for my boys clothes cupboard that I'm excited about. I will post soon. Louise - you are right! And it has my initials on it too. I love it, but it's like £1800 - and I wonder if it might not be so impressive in real life. Brandi - it's only because I have a business that I'd have enough stationery to put in them! I loved the Elemental one too (have you visited their shop in Spitalfields? It's amazing), but I also liked the clean simplicity of the Retrouvius plan chest. I occasionally spot them at the antiques auctions I visit, but they are so expensive! Currently I use a great little G-Plan chest of drawers that I picked up at a local junk shop, but it's almost full already! I've had one of these chests on my wishlist, too. I love the Elemental one. So pretty and love its vintage style. I want one so badly! I'd love to store my illustrations in a flat file. Oh how I love these too - I go through phases of watching them on ebay. I want one as a coffee table and the cheapest option for me seems to get half a salvaged one (they split into to top and bottom usually). Then it will be right height for coffee table also! Like you, never seem to quite have the funds for this one. 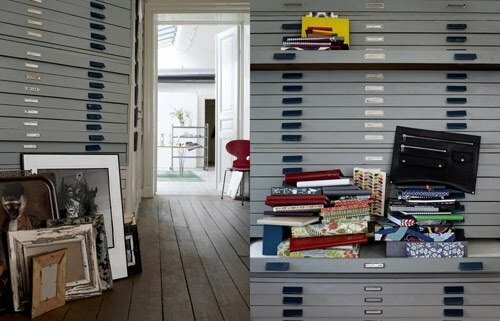 These file cabinets are great! I could use one so desperately, but I don't have anywhere to put one. Hopefully in the future. Thanks for the inspiration! The Elemental is amazing and would definitely choose it, not for that price though, when I have my own space I can't wait to get one of these either. I am guessing the one with the letters on is your fav?? Am I right?!! Yes that's my fav too - wish I had the space for it though. I've been eyeing up that Elemental one for a while too! !